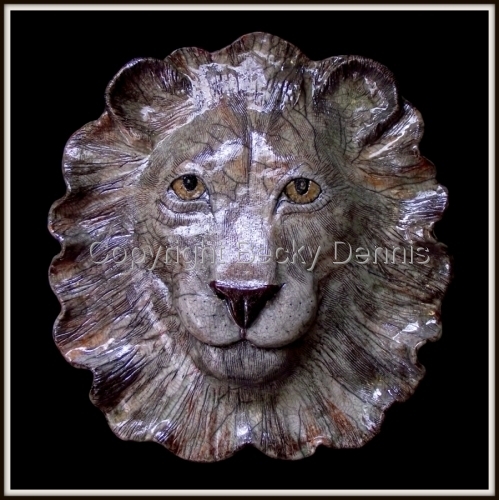 My Love of LIONS is reflected in this One of kind, hand sculpted, RAKU fired, Clay LION. 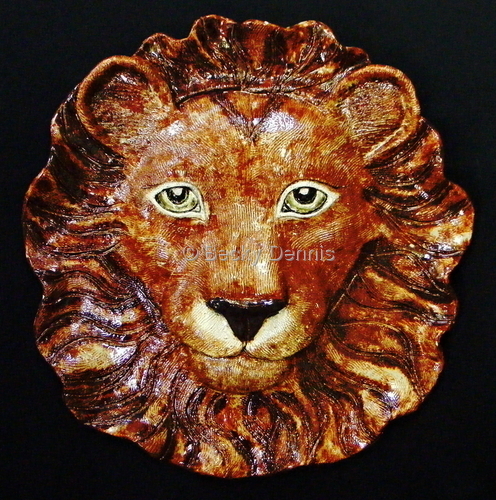 My Mother commented that the Lion seems to have age and wisdom in his eyes, hence, the name. On the back, it says, "May we find our Voice, and ROARRR with Wisdom." He is awaiting his perfect Home. Normally, I do not really prefer to create commisioned Pieces, unless the Person understands that I work in my own time and pace. 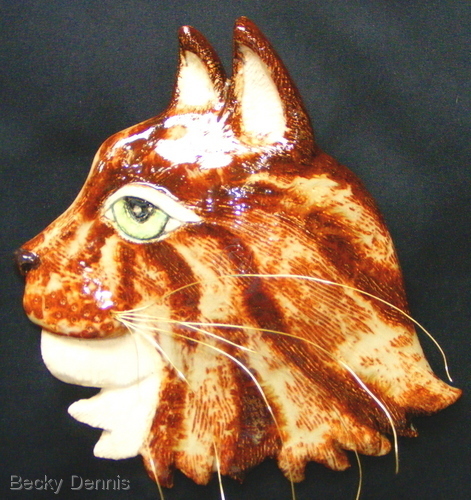 This hand created Clay CAT was created for a very sweet couple who waited patiently for me to finish Him, and his Cat Friend, Oscar. Yes, Felix and Oscar! 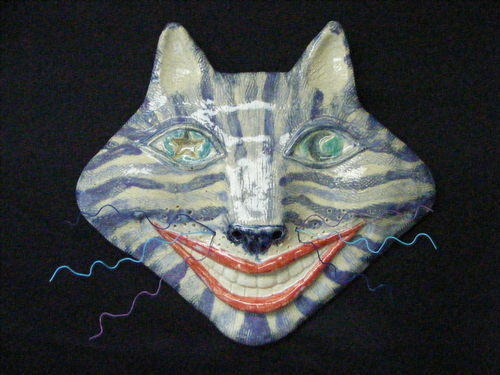 You can see the Image that I worked from when calling Felix forth in clay. The folks that I did the work for have seen Pictures, but, not yet gotten the Pieces. 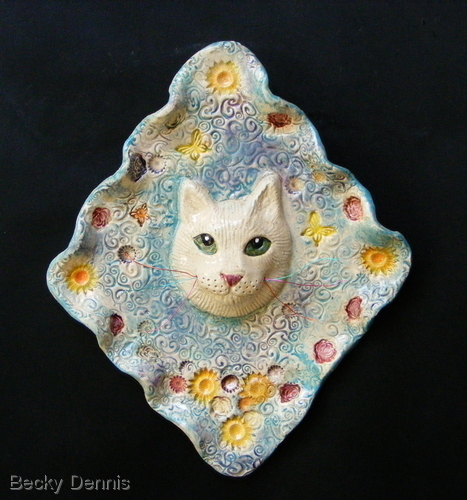 Purr-ty Cat meets Purr-fect Pansies. 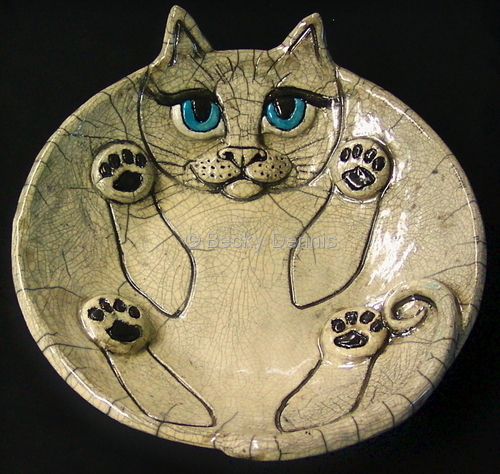 Raku cat bowl.Joyfully Inspired by my cats that lay on their backs with their sweet paws in the air. SOLD. 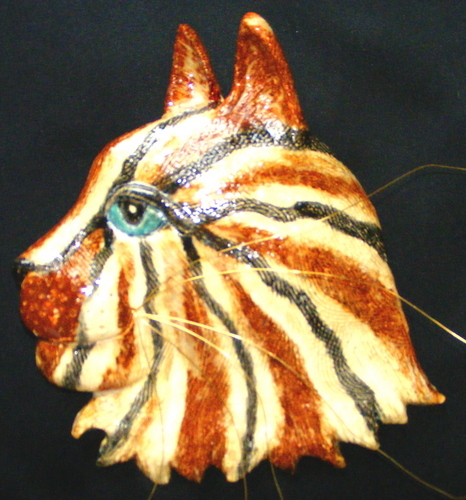 Two others are currently available in raku. In our Life Journey, we have had many CATZ choose us to Love them. They are the motivation and inSpiration for so many of my clay Pieces. 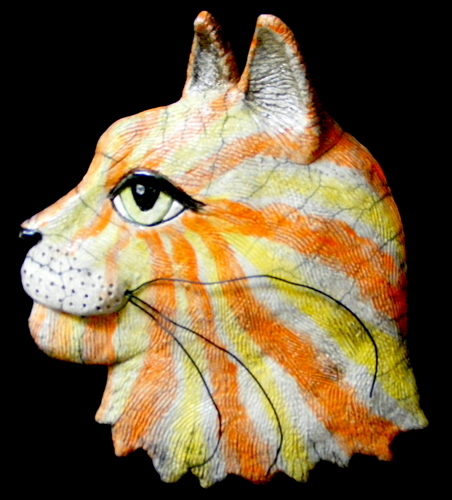 Although we have not yet had a White Cat, I decided to create ONE and raku fire it. 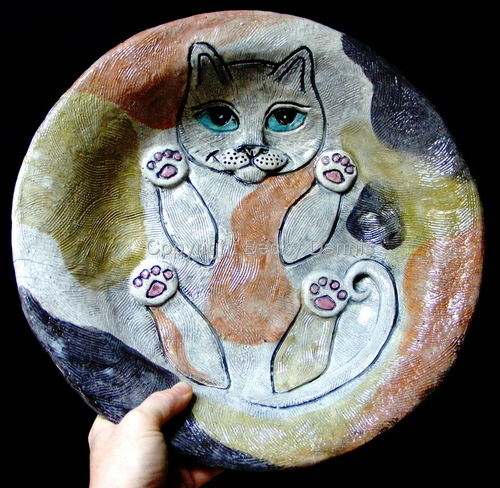 The crackles are desirable in RAKU and I am thrilled with the outcome of this HAPPY, HAPPY Cat. 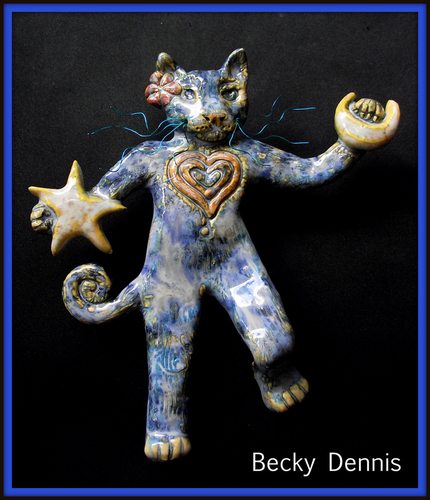 Whimsical and deLight-full, this dancing Blue Tabby Cat is holding the Sun and the Moon in his hands. 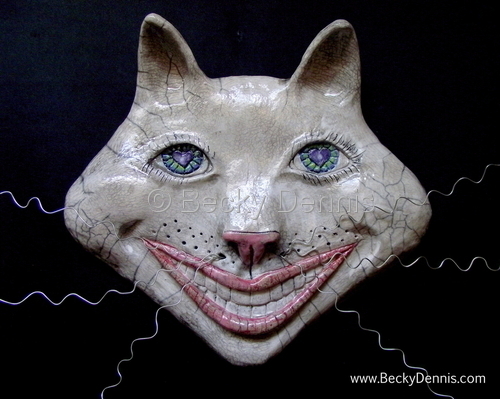 InSpired by the many Cat Beings that own us. Willing to reproduce ONE with any Colors that You desire. 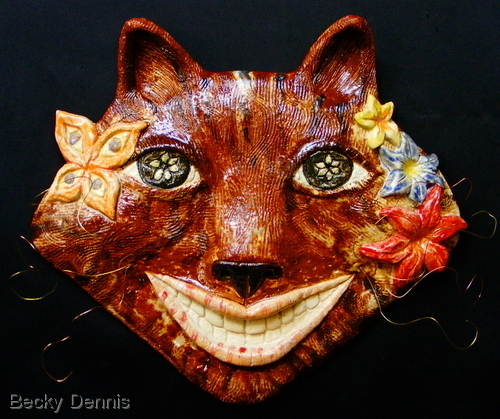 This happy Cat with whiskers is one of my new designs from a series that will be called "Garden Cats." Each piece is brightly colored. They are light-hearted and whimsical. 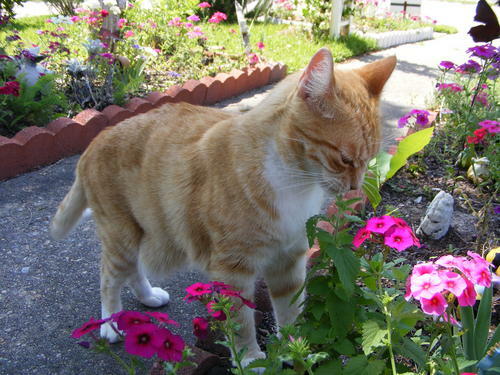 Garden Cats will bring a smile to your face. The message on this piece says "We are re-newed by love." SOLD 2008. 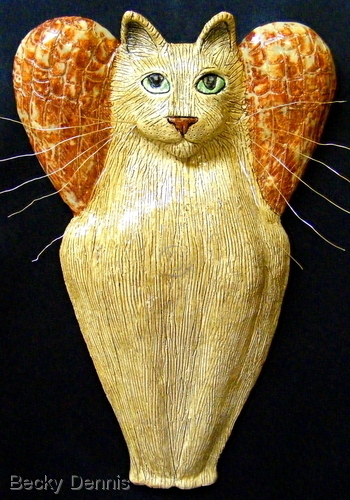 Stoneware Cat Angel wallhanging. Can recreate a similar piece. 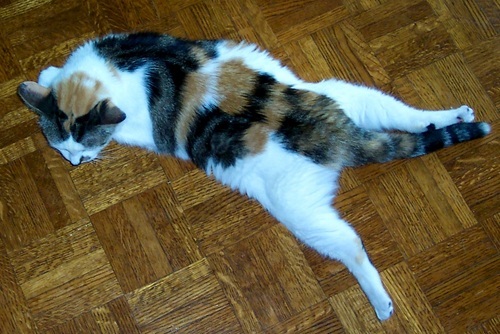 Cats are always being re-created in many colors and shapes. The price depends on the size and firing method. Special orders considered. 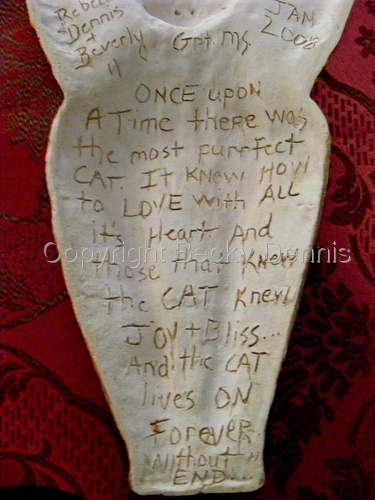 Cat angels are a reminder of the LOVE that NEVER DIES! All my cats live in my heart forever. 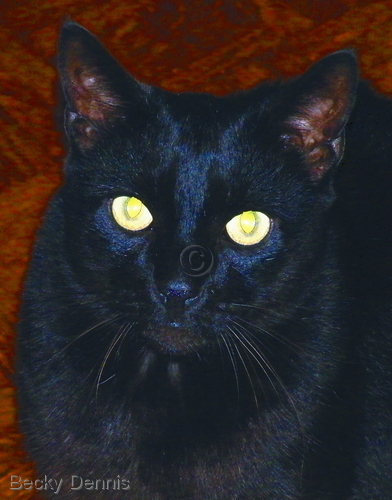 This photo of our Cat Friend "Shadow" reveals the amazing fortune and auspiciousness that black cats offer a family. 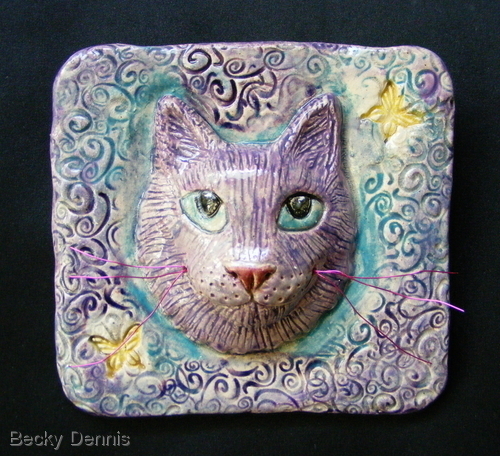 This hand-sculpted CAT with sweet wired whiskers is from my Cheshire Cat series. Certain to bring a smile to your face and Joy to your heart. 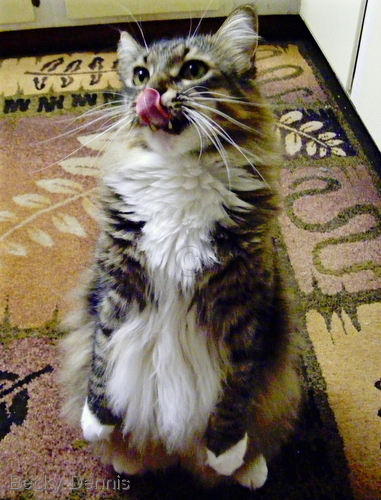 All of our CATS have been very easy to train with positive reinforcement. 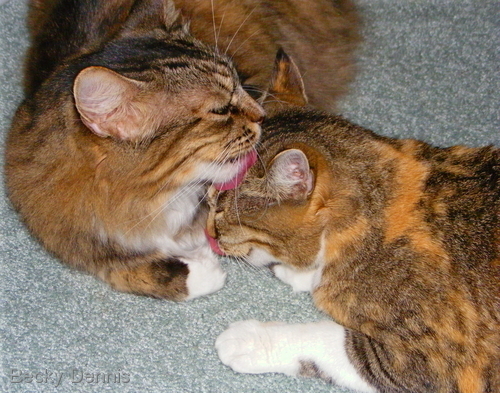 This photo was captured one night while I was working on the computer and glanced over at Yogi and Kali licking each other. The mother cat is the one on the right and Yogi is on the left. Out of four kittens, he is still her eight year old baby. 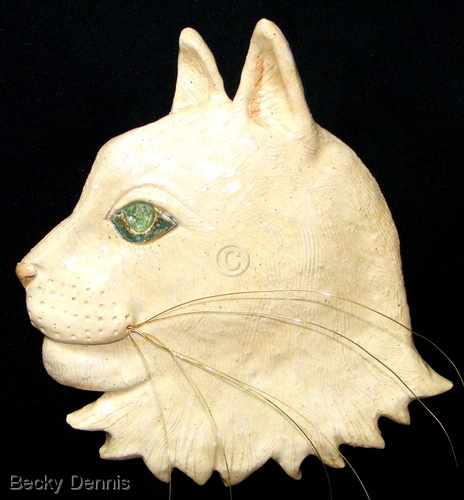 White Cat Angel with Whiskers. 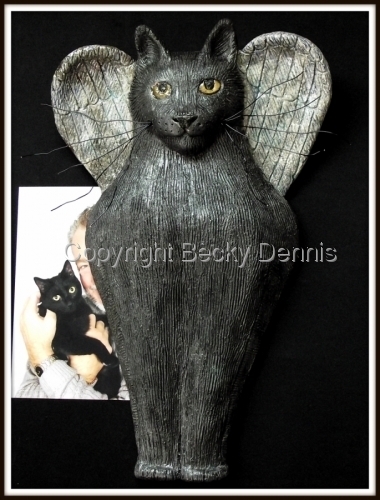 Handmade Cat angel with whiskers and story of healing on the back. 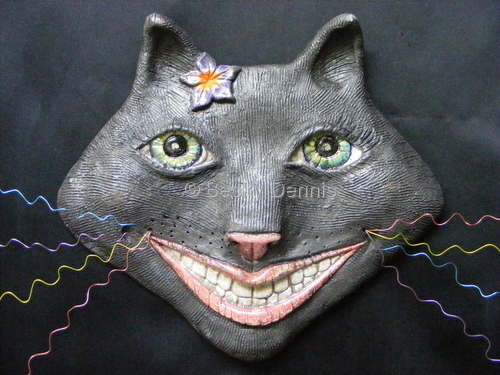 This Raku Cat face mask has flamboyant whiskers and a wide grin with one small flower in it's fur. The message on the back of the piece says: "Smile, you are loved!" Kali is rescued and kittens are born. 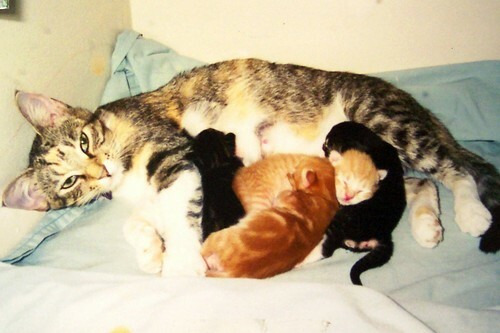 Kali the Momma cat with her newborn babies in 2000. 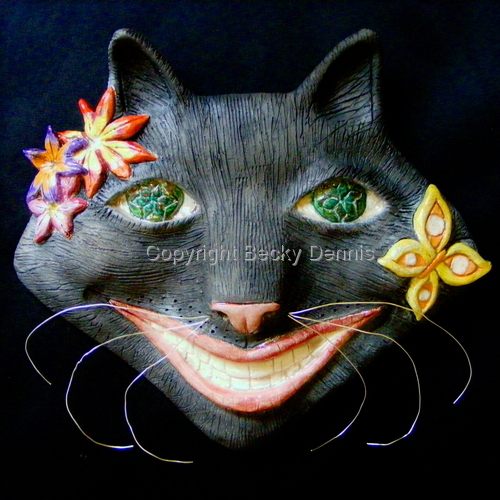 This happy Cat with whiskers is one of my new designs from a series that will be called "Garden Cats." Each One is brightly colored. They are light-hearted, whimsical and will bring a smile to your face. 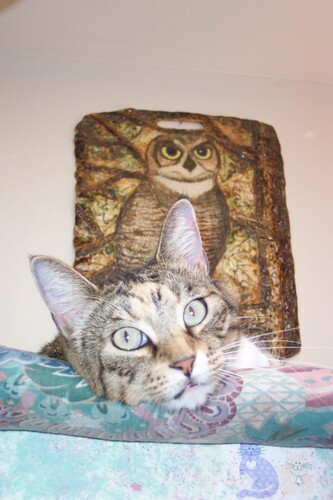 Calico cat on shelf with owl. Sunny Too in the catnip. 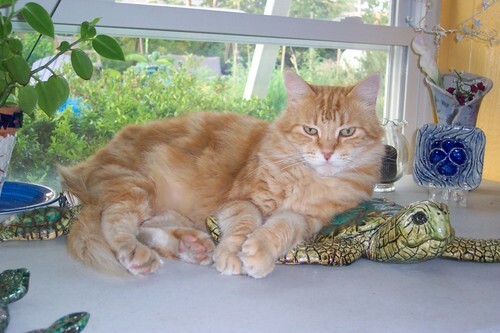 Long haired orange cat with turtle. Calico cat who told me to call her Sassy... and she was that! Died 2007. 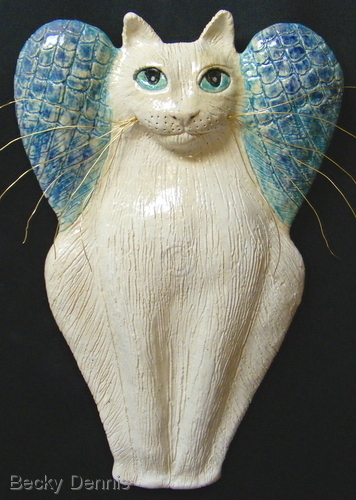 Hand sculpted stoneware cat angel. We have rescued so many cats over the years and given them safe haven. The angels are my way of celebrating the life of each and every one. It is a way of remembering that LOVE dwells forever within the heart long after the body is gone. They often have messages on them that communicate a healing message of love. SOLD. Sir Ivan Grey in my red shoes. Yes, Ivan loves me. 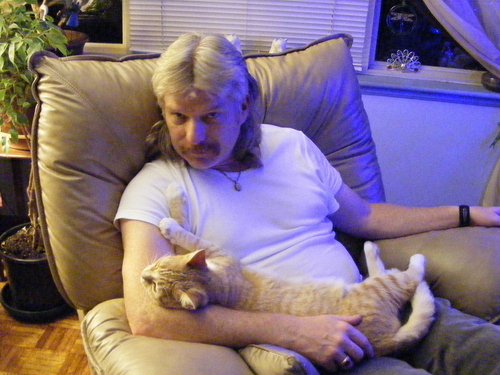 I know people say that "cats" are not loyal, but I know that to be inaccurate. 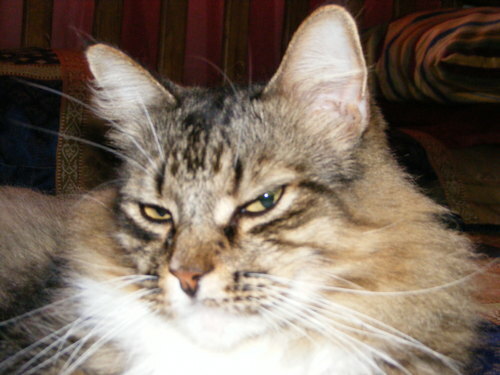 THIS cat, Ivan, was a wild cat that someone threw away because he had elimanation challenges. He was named Sir Ivan Grey because he experienced the winds of hurricane Ivan that hit Pensacola Florida very hard and gave us a few BIG gusts as well. At that time I was unable to catch him, but with persistance, I did finally capture him and have him neutered.Fortunately my VET loves my work and has traded with me for services. Working with Ivan presented many challenges. I literally had to wash his behind with soap and water almost every day for over a year until I was able to find the perfect balance of healthy food, herbal supplements and LOVE to facilitate a healing. 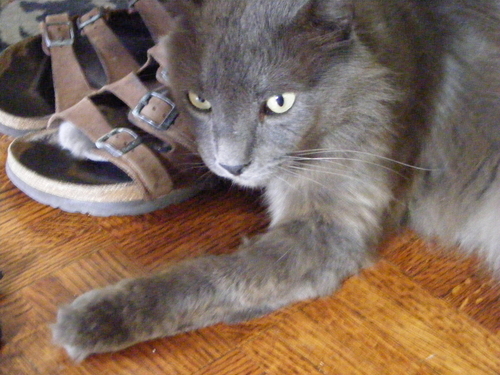 He is very vocal and brilliant and grateful to have a wonderful home. YES, I am a Cat Whisperer as well. Remember that love and patience can tame the most savage beast and heal hearts. 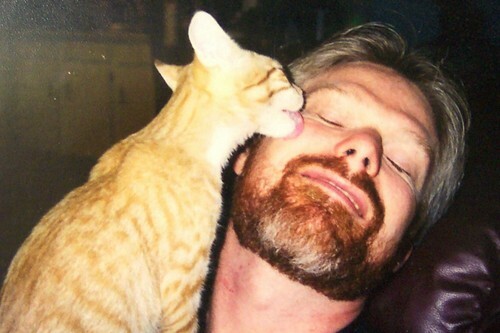 Sunny Too licks Chris with an expression of LOVE. 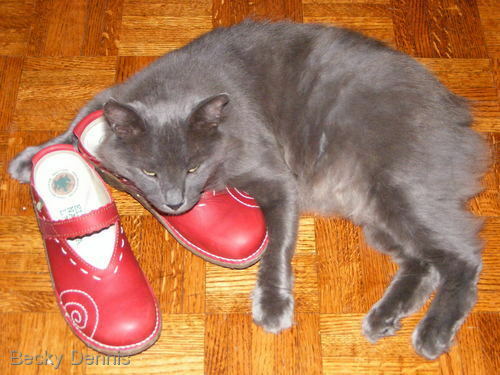 Ivan loves me and my shoes! Sir Ivan Grey the manx cat creates photo opportunities continually! 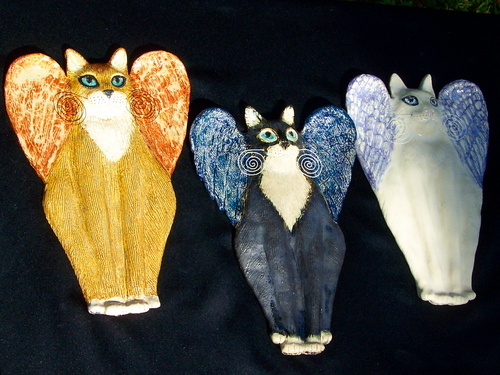 Stoneware cat angel wallhangings. All sold. Can recreate similar pieces. 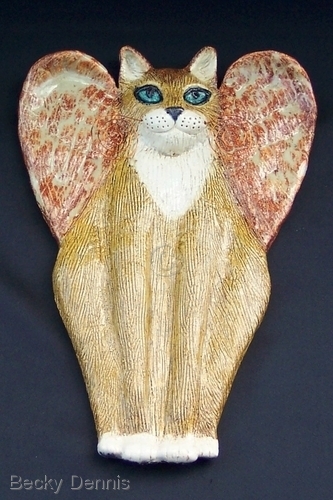 Handmade stoneware cat angel with written message on back of piece. 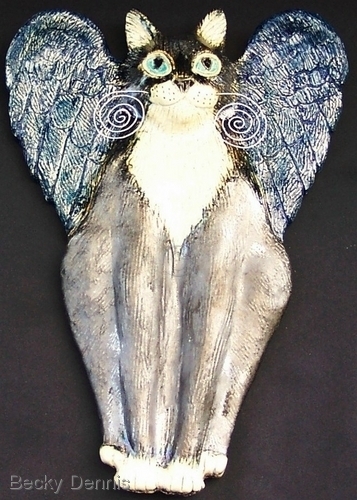 This picture of Lukah was taken after unloading the kiln. Lukah is my SweetHeart! 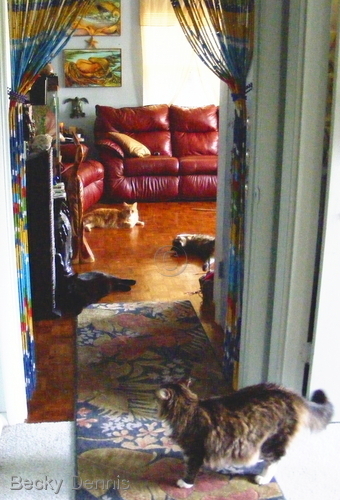 This photo was captured one morning when I was walking into the kitchen and saw four cats waiting for their breakfast. They are even in the bathroom! 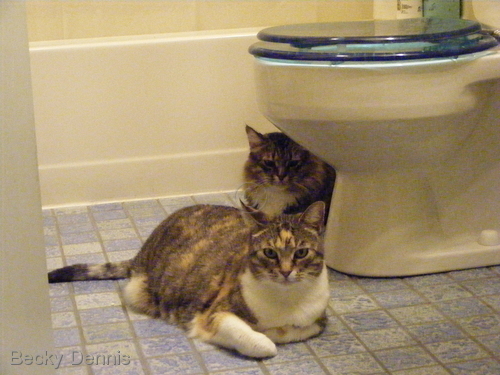 This photo was captured one morning when I was walking into the bathroom. They are everywhere! That is not a complaint. 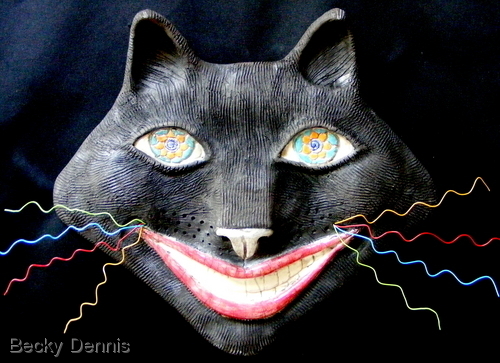 I live a hermitic artist's life and the cats are lovely companions and great teachers. 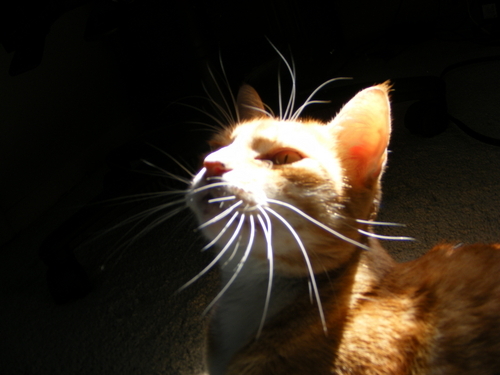 This picture of Sunny was taken as the winter Light was pouring in the south window of our beautiful Living room. Sunny felt it was still too cold to venture outside! Sometimes it even SNOWS in Misissippi! So ironic that I recently had the most amazing SNOW dream. Left me Feeling so Good. Reduced price. 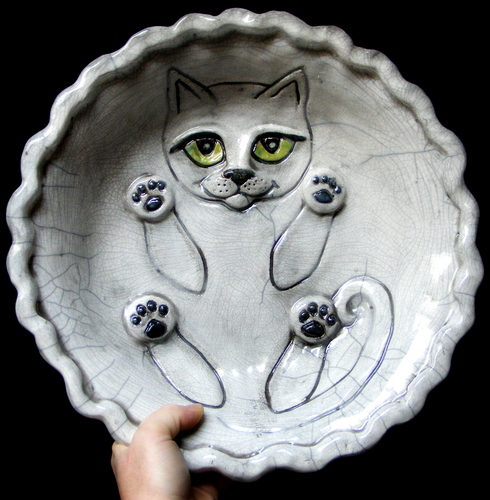 Unique,Raku fat cat bowl. Inspired by my hungry cats that eat only the best food! ART IS A SAFE INVESTMENT.... and provides many Lifetimes of JOY. 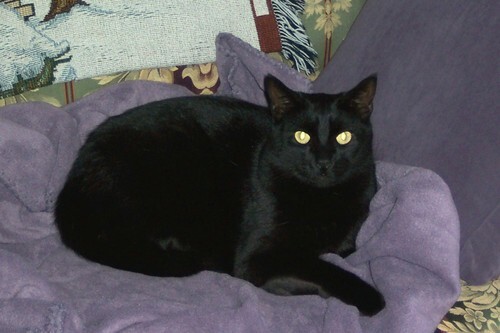 Black cat on purple blanket. 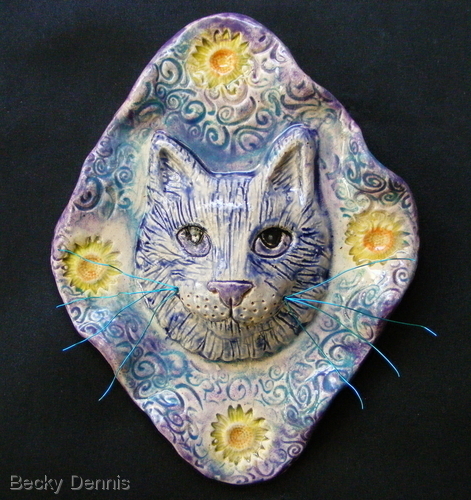 Reduced price.Raku fired clay calico fat cat bowl. Again, inSpired by my hungry cats that eat only the best food available! Your purchase assures they will continue to eat well! 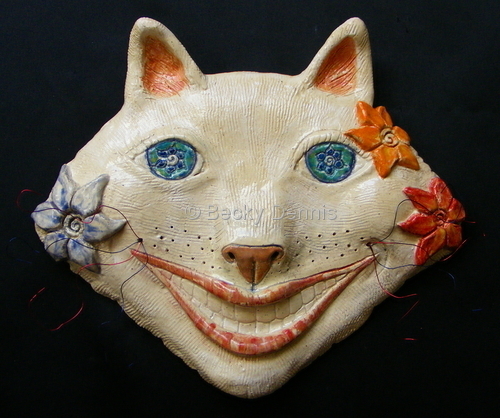 They say: "Meowwwww." 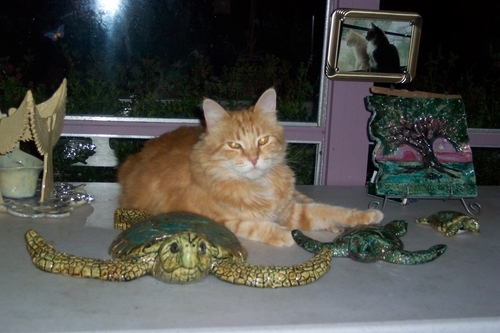 Yogi with sea turtle sculpture. 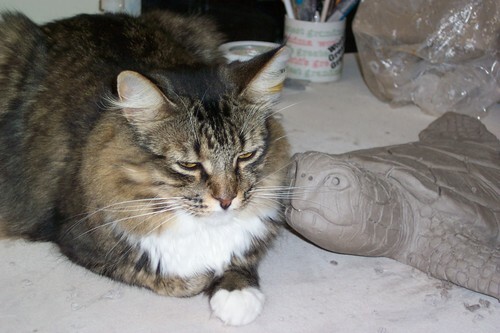 photograph of Yogi with sea turtle clay sculpture. 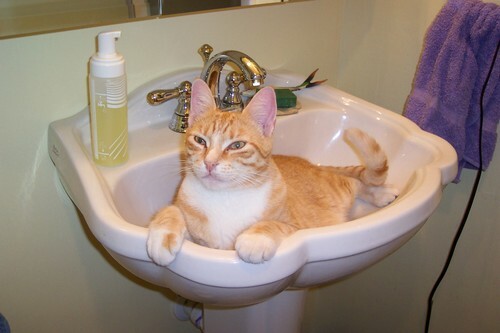 WE live with six very affectionate Cats that we have rescued. This is Sunny with Chris. (And yes, they are all spayed and neutered.) After all, they choose us, and we are simply the caretakers on the Journey. 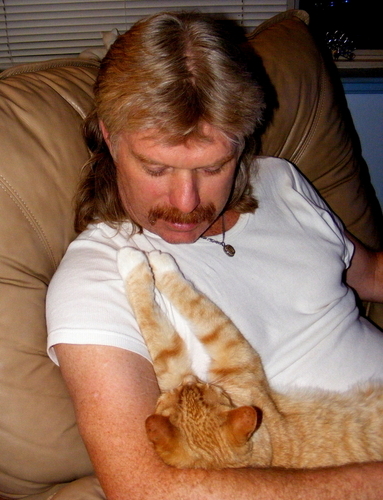 A sweet moment captures where Sunny was resting safe and comfortable in my husband's arms. 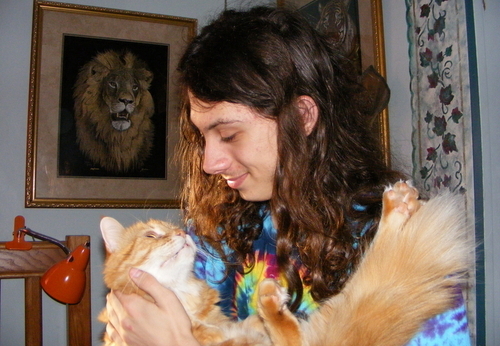 When Jacob was only 6 years old, I took a picture of him holding Lukah the cat in his arms. That was ten years ago and at Christmas, I was able to take this picture again. It was even more meaningful because Lukah nearly died in 2009. We were surprised and excited that he did not leave us yet. This photo was taken November 2008 at an outdoor art festival called The Peter Anderson Memorial Festival in Ocean Springs, MS. 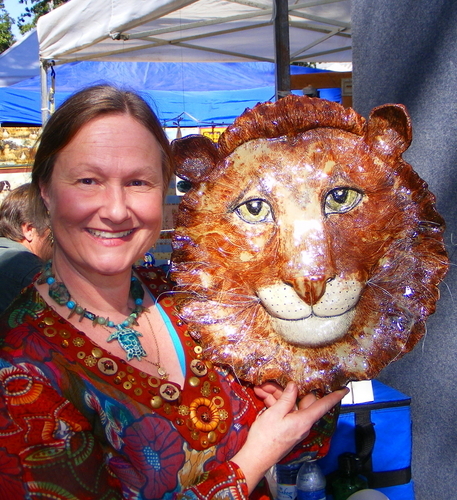 The Lion head sold the day after it was completed. Willing to take orders with a deposit. SOLD. 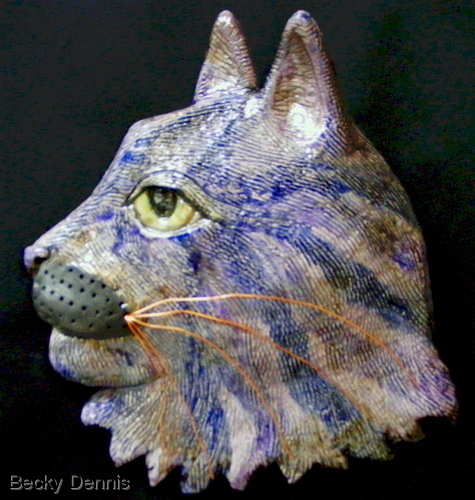 This hand-sculpted CAT with sweet wired whiskers is from my Cheshire Cat series. Certain to bring a smile to your face and Joy to your heart. 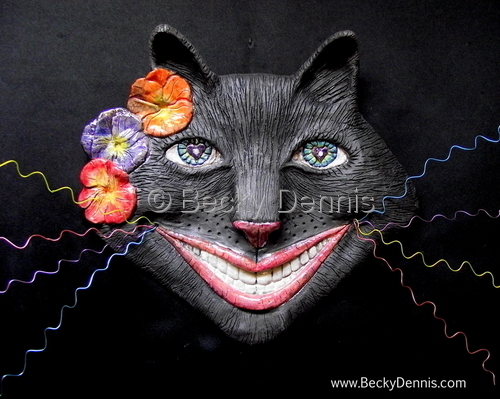 This happy Cat with whiskers is one of my new designs from a series that will be called "Garden Cats." Each One has bright, cheerful colors. They are light-hearted, whimsical and will bring a smile to your face.